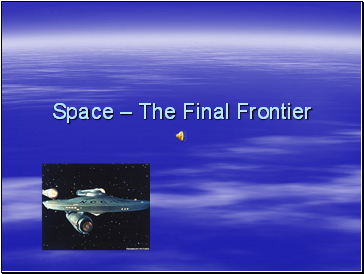 Astronomer - Astronomers use the principles of physics and mathematics to learn about the fundamental nature of the universe, including the sun, moon, planets, stars, . Nicholas Copernicus – (1473 – 1543) the first astronomer to teach that the sun (not the Earth) was the center of the solar system. 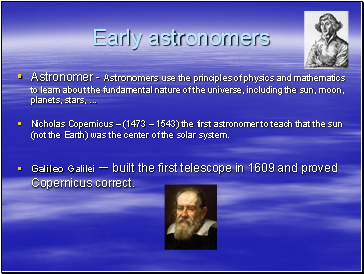 Galileo Galilei – built the first telescope in 1609 and proved Copernicus correct. 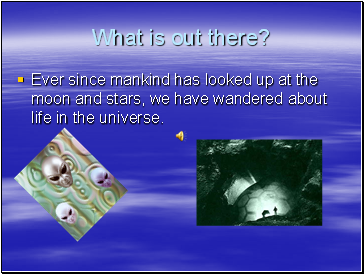 Ever since mankind has looked up at the moon and stars, we have wandered about life in the universe. 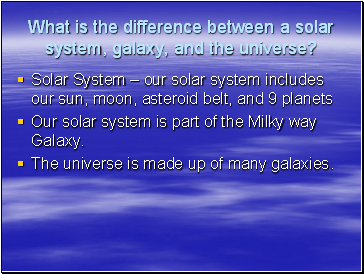 What is the difference between a solar system, galaxy, and the universe? The universe is made up of many galaxies. We can observe only a portion of the entire universe. Because the universe is only about 14 billion years old, light has only had about 14 billion years to travel through it. 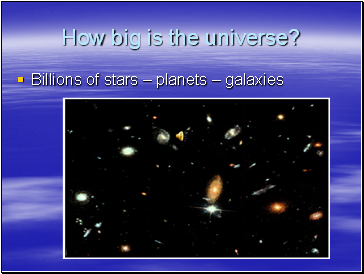 Therefore, the most distant regions of the universe we can see are about 14 billion light-years away. 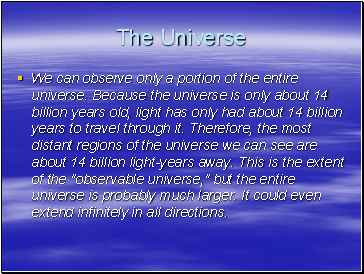 This is the extent of the "observable universe," but the entire universe is probably much larger. It could even extend infinitely in all directions. 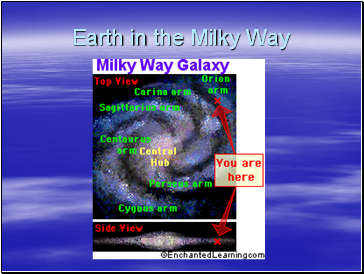 The name of our galaxy is the Milky Way. Our Sun and all of the stars that you see at night belong to the Milky Way. When you go outside on a dark night and look up, you will see a milky, misty-looking band stretching across the sky. 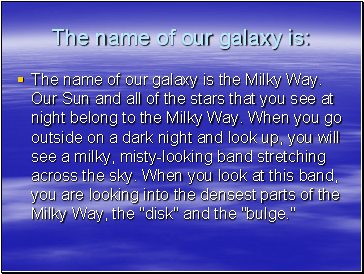 When you look at this band, you are looking into the densest parts of the Milky Way, the "disk" and the "bulge." 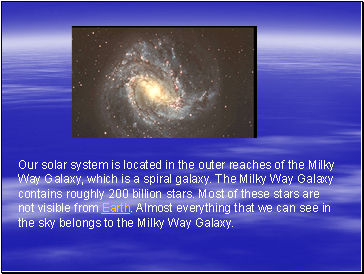 A galaxy is an enormous collection of gas, dust and billions of stars held together by gravity. 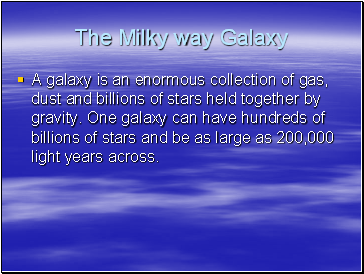 One galaxy can have hundreds of billions of stars and be as large as 200,000 light years across.